Nothing is more embarrassing than a person in front of you frowning and saying “I think you've got something on your face,” only to realise the 'thing' they reach out to brush off is actually a part of your face. Acne, which is the medical term for spots, pimples, zits, and blackheads, is a skin problem that starts when oil and dead skin cells clog up your pores. Considering how many people suffer from the condition in their lifetime, it is surprising that it is one of the most poorly understood skin problems. For example, many people believe acne only takes place on the face, but breakouts can occur on someone's arms, chest and back. There is also the preconception that it only affects teenagers. Over 80% of cases of adult acne occur in women according the British National Health Service. It is thought that many cases are caused by changes in hormone levels that many women have at certain times. These include just before a woman's period, during the first three months of pregnancy and due to polycystic ovary syndrome, which is a poorly understood but common condition. Thirty-three year old Rohima believes her acne began at the age of 25, when she wore heavy make-up for her wedding. “I had soft clear skin and rarely used any foundation or concealer, but it's just not been the same since my wedding,” says the young mother of two. If you've lived with acne or with the fear of getting acne, you've probably been exposed to many myths about the skin condition. “Don't eat greasy food,” “Wash your face lots,” “Squeezing the zit is the best way to get rid of it,” and so on. Are any of these true? the Star looked at some of the common mistakes people are making around the world when treating this universal irritation. 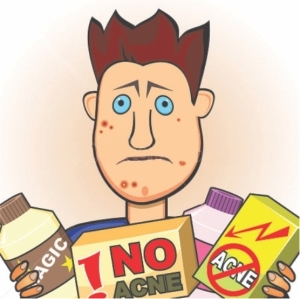 There is no evidence that diet plays a plays a role in acne. Eating a healthy, balanced diet and drinking a lot of water is recommended because it's good for your heart and health in general. But it will not cure your acne. Most of the biological reactions that trigger acne occur beneath the skin, not on the surface. Therefore, how clear your skin is will have little to no effect on your acne. You should wash everyday and wash your face twice a day but more frequent washing will make no difference and could make symptoms worse by aggravating your skin. As tempting as it is to pop what may seem like a mountain on your face, doing so will only prolong the healing time and increase the risk of scarring. Infected material can get pushed further into the skin, leading to more swelling and redness. No matter how fast a pimple comes up, no solution is as immediate. It can take two weeks or it can take six weeks for visible change to happen and this often means people give up before the skin has had a chance to improve. Dermatologists recommend giving one product at least a month's trial before moving on, and to continue using it if you see some improvements. An interesting fact to note is that acne may need to get worse before it will get better, so patience is crucial. 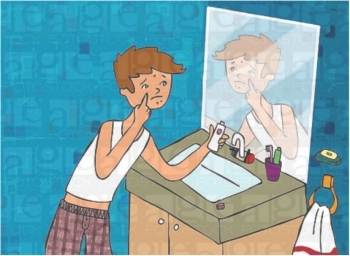 Just before you're starting a new school year, new job or new relationship, you might suddenly develop a bout of acne. Your first stop, the pharmacy. You buy a face wash, a face peel and a see-a-difference-in-4-hours gel. When you don't see a result, you move on to another product and this, specialists warn, can cause more irritation than clear skin. Give one product a chance. Acne isn't from dirt but many people tend to over-wash or over-scrub their face when they get acne. It can make things worse, as it can compromise the skin's protective barrier and can increase irritation. Instead, gently wash with a non-irritating, pH-balanced cleanser to decrease inflammation. It's also important to thoroughly rinse off the cleanser. Additionally, make sure you're using the right product for your acne-prone skin. Harsh cleansers, alkaline bar soaps and alcohol-based products may worsen acne. Certain ingredients in cosmetics, sunscreen and moisturisers, such as oil, cocoa butter and D & C dyes can clog pores and lead to breakouts. If acne is taking its toll on self-esteem, becomes painful, causes excessive scarring or if over-the-counter medications aren't clearing it up – it's time to make an appointment. Dermatologists have ways to treat acne; they can prescribe stronger does of over-the-counter medication, oral antibiotics and offer new treatments like light and laser therapy and chemical peels. There can be a temptation to self-prescribe acne medication in Bangladesh as there are no restrictions are pharmacies. However, you risk overusing or under-using a prescribed acne medication so it is wise to see a medical professional before attempting to use prescribed meds. It is best to taper medication usage by using it less and less. If you've been using it twice a day, bring it down to once a day before using it every other day, and then to twice a week before stopping. To keep skin blemish-free, most people need to continue using at least one acne product, regularly or a few times a week. The real challenge for all acne sufferers is patience. Without it, you'll give in to one of the mistakes above and remain in a cycle of frustration and pimples so good luck and be patient.